Last week I posted great value finds from tasting more than 350 wines as a judge at the San Francisco Chronicle Wine Competition. 1) Wines I really loved that are reasonably priced. 2) A couple of rare oddities that I might foolishly have turned my nose up at, had I not been asked to judge them. First, the great wines. There's a strange theme here: all four would have been illegal in Europe, because the winery is in one AVA but the grapes (and the label listing) is from another. Sometimes Europeans don't know what they're missing. 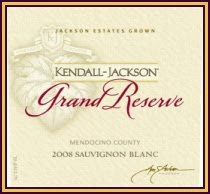 Kendall-Jackson Grand Reserve Mendocino Sauvignon Blanc 2008 ($20): I guess those K-J people know how to make white wine, but they should have priced it 1 penny less. This wine is simply outstanding; intense passion fruit and lime flavors with good balance, a fine mouthfeel and a very long finish. It won the $20 and up Sauvignon Blanc category and would have easily won the $14 to $19.99 category -- which I was a category judge on -- had it been 0.05% cheaper. As it was easily the best Sauvignon Blanc out of 199 submitted, had it been listed in the cheaper category, I think it might have won best white wine overall. I voted for it. Brazin Fall Creek Dry Creek Valley Zinfandel 2007 ($25): I voted for this as my red sweepstakes winner, meaning I thought it was the best red wine of the whole competition. It's spicy, with great fruit both black and red and complexity, as well as good balance. I don't know anything about this wine, but the winery usually makes Zin from Lodi, so maybe this was a small production one-off. In any case, I kept going back to it while tasting the other best of class winners, and I thought for varietal character, interest, deliciousness and price performance, this wine was tops. Hopefully you'll have two chances to try it, at ZAP on Jan. 30 (win free tickets here!) and the Chronicle competition's public tasting on Feb. 20. Storrs Winery and Vineyards Two Creek Vineyard Santa Clara County Rhone Blend 2006 ($25): This vintage is apparently not on sale yet, as the Storrs website is still pushing the '05. It's a savory, spicy, interesting blend, reminiscent of a good Chateauneuf du Pape (not one of the '07 extraction monsters, if that's what you're thinking). Apparently the vineyards are dry farmed and produce only about 1 ton an acre, which makes this a very fair price. Santa Clara County has plenty of people wealthy enough to afford a $25 bottle even in a recession, so get thee to Storrs and support your local winery. Quinta Cruz Bokisch Vineyard Mokelumne River (Lodi) Graciano 2007 ($28): This was in my top 5 wines from all the best of class winners, and was the "non-traditional" red varietal that most impressed me. Quinta Cruz is actually a second label for Santa Cruz Mountain Vineyard, but the grapes come from the Lodi vineyards of Markus Bokisch, a specialist in Spanish varietals. This wine had great red fruit and acidity, but what I liked best about it was that it had presence in the mouth without weightiness. A number of other judges mentioned how much they liked it, and it makes me wonder how close it came to winning the overall prize. Now, the oddities. It's thrilling to taste what a winemaker committed to excellence can do with unusual fruits. At these prices, these wines are truly labors of love. I had never tried Diamond before this one; it's a cross of two native American grapes, Concord and Iona. It's an intense, distinctive wine, with savory character, a Riesling-like diesel note, melon fruit and a bit of the "foxiness" that native American grapes are known for. I only sipped it a few times in trying it among all the other white Best of Class winners, so I don't know how well I would enjoy a whole bottle. But for $10, I'd certainly be motivated to find out. 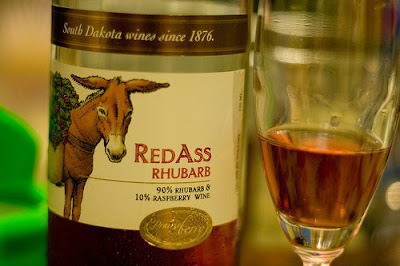 This is one of the best fruit wines I've ever had. It's tangy, like having rhubarb pie, and its moderate sweetness means it could work well with dinner or dessert. Unless Oakland A's second baseman Mark Ellis starts hitting again, this wine could be my 2nd favorite thing about South Dakota, just behind watching untrained college kids wrestle alligators at Reptile Gardens.